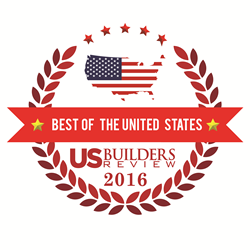 US Builders Review has released its annual “Best of the United States” 2016 special edition, featuring more than 60 of the nation's top construction companies. Since 2013, US Builders Review, a leading construction trade journal, has recognized construction and building companies from across the country for their industry contributions, commitment to employees and forward thinking through the annual Best of the United States awards. This year, 66 companies and three projects were selected from nearly 700 eligible businesses; stories about them appear in a special US Builders Review “Best of the United States” edition. Due to the high number of honorees, the 2016 special edition is broken down into two volumes. Among the companies recognized are cover stories Bergeron Land Development Inc. and Idaho Pacific Lumber Company (IdaPac). “IdaPac sells nationally and it’s important to get our name and our story out there in front of customers and suppliers– both established and new– and also to potential new employee-owners who may desire working and building something fun and profitable for the long haul,” says Scott Sunday, director of purchasing & sales at IdaPac. “‘The Best of the United States’ cover feature is a great vehicle for IdaPac to get the word out." For more on these and other companies being recognized, view the special editions online. The full list of honorees is below. Burns & Scalo Roofing Company Inc.
Hi Tech Data Floors Inc.
To nominate a company for the “Best of the United States” 2017 special edition, contact Nick Randall at nrandall(at)usbuildersreview(dot)com. US Builders Review is a digital trade journal striving to build strong connections within the many sectors of the U.S. construction industry. The industry leading trade journal connects with top executives representing general contractors, custom builders, specialty trades, architects, engineering firms, suppliers and more to draw out unique perspectives and insights to the advances and challenges of the country’s varied construction markets. US Builders Review is created and published by TrueLine Publishing.